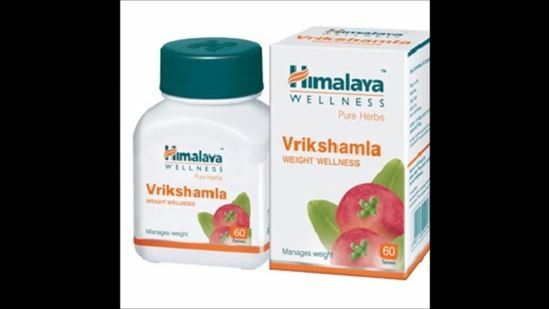 Himalaya Vrikshamla Tablet contain Vrikshamla (Garcinia/Garcinia indica) fruit contains an active component called hydroxycitric acid (HCA), which supports normal fat and carbohydrate metabolism, a healthy appetite level and optimum body weight. It also supports weight loss by reducing the body’s ability to form adipose (fatty) tissue, potentially enabling more fat from foods to pass through the body without being stored. Additionally, HCA blocks the production and storage of fat and cholesterol when calorie consumption exceeds healthy levels. The herb is also known to reduce blood lipid levels and to naturally lower cholesterol. Vrikshamla Tablet are a 100% vegetable nutritional supplement that helps with weight loss and management. Adults and children above 14 years of age can take one tablet, twice a day after meals.